It’s time for us to have a housewarming party. After much decision and my ill-fated desire for a toga party, Mary and I decided we would host a martini party – a Retro Martini Night, to be specific. We drafted up invitations and went around and met all of our neighbors to invite them, got the Young Professionals involved, and invited all the people that would come have a great time at the loft when we would do this. Turns out basically all the neighbors are coming and now we’ve got another 50 friends on top of it. Fun, and dangerous. There hasn’t been an event here this size since the early 1980s. 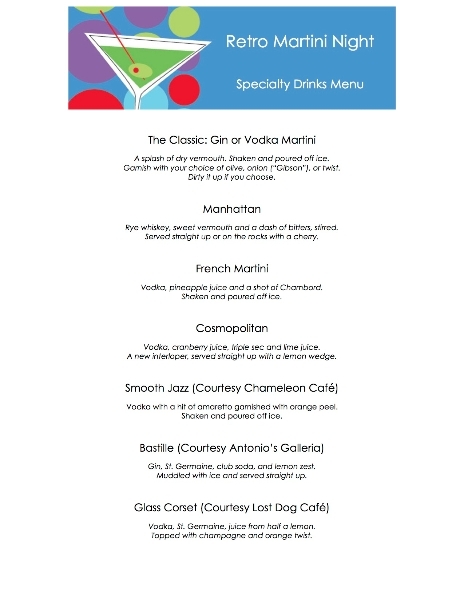 As with all things we do, Retro Martini Night is a classy affair. It has it’s own graphics, font, and menu. A picture or two will surely follow. 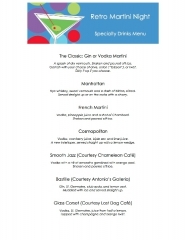 This entry was posted in memories and tagged martini night on April 27, 2013 by Douglas Camin. Love the menu! Looking forward to the pictures. A bar menu is a good idea. I left my wet bar open as a free for all area for everyone to make their drinks during my recent cocktail party. The next day it looked like tiny localized atomic bomb had gone off. I can’t stress enough the peace of mind a stockpile of paper towels will bring you. I’ll put some pictures up in the next day or two here. Robert – I assure you it looks like an atom bomb whether you have a bartender or not. Heh. I had several buddies playing bartender all evening while I played host and DJ. Dance party definitely broke out in the living room.